I think I have a new go to recipe, at least one that lends itself to improvisation. Which is one of the best kinds of recipes to have. I made these Sweet Cheese Muffins for my Friday get-together, and had to play around a little more with this recipe. I wanted to add some chopped ham in with the cheese and since I just happened to have some sweet ham in the fridge, it was a no brainer. And guess what? We got together with a bunch of friends on Sunday so I decided to try the ham idea on them. 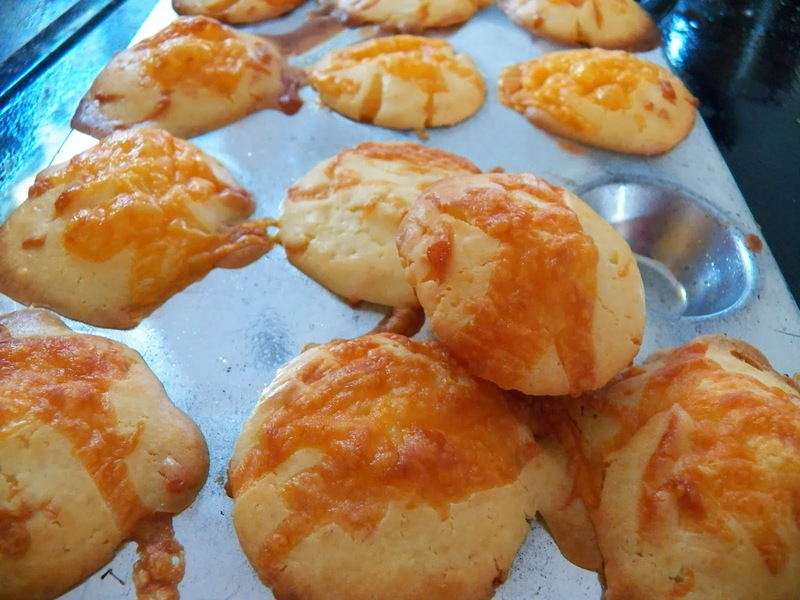 The first time I made the muffins I used some Colby Jack Cheese I had already shredded and this time I used some Sharp Cheddar Cheese. 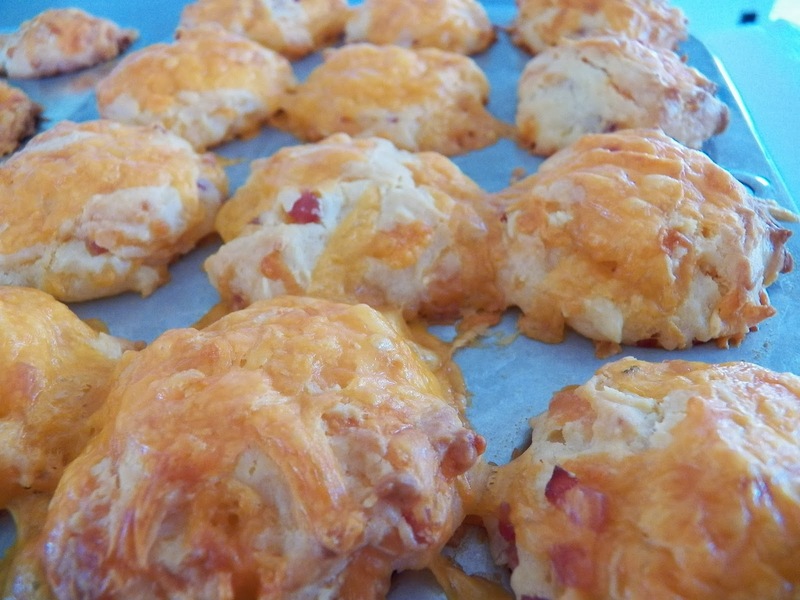 I like the Colby Jack Cheese better in this recipe but the muffins still got eaten. 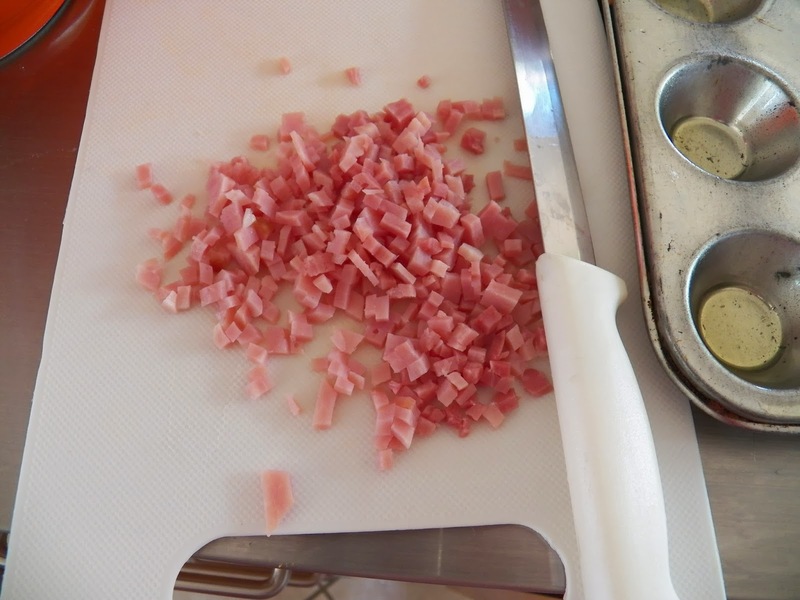 I only added the ham to half of this recipe because I knew there were some vegetarians coming and I wanted to make sure they could also sample my offering. 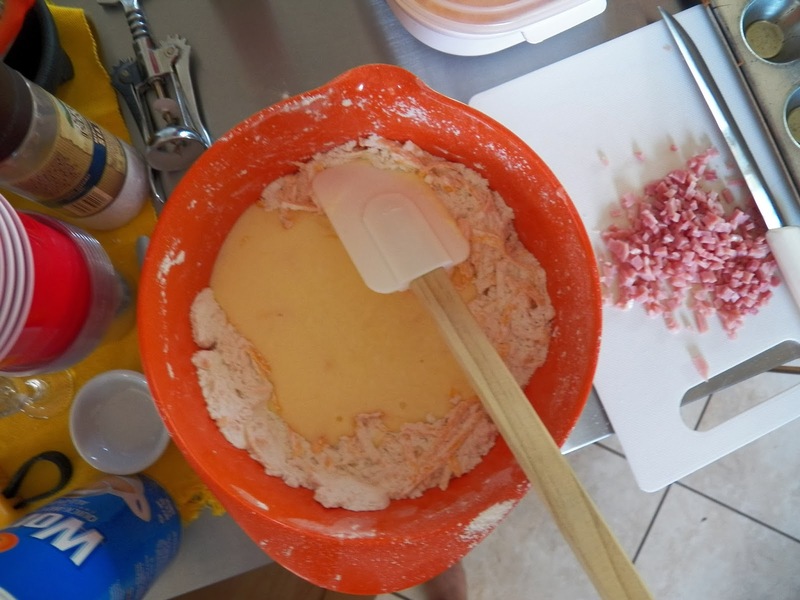 then pour the wet ingredients over top and mix lightly. You want the dry ingredients to be just moistened. Don’t over mix. 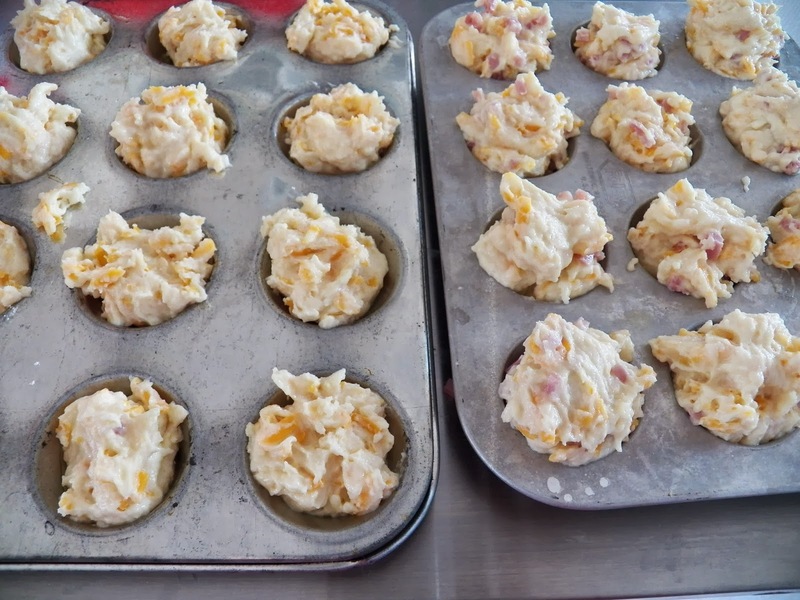 Spoon the batter into either a regular muffin tin to make 12 muffins or into two mini muffin tins to make 24 mini muffins. 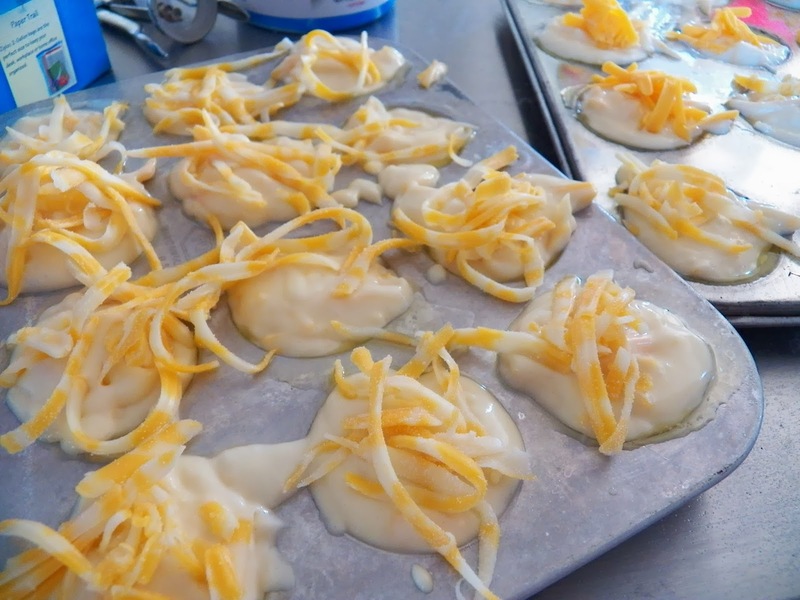 Top each muffin with a sprinkle of the 1/2 cup of shredded cheese and place in a pre-heated 425 degree oven. Bake at 425 degrees for 12-15 minutes, turn oven down to 350 degrees, bake an additional 10 minutes or so until the tops are lightly browned and the cheese is melted. I get together with a bunch of ladies on Friday Nights and thought they might like to try something a little different. 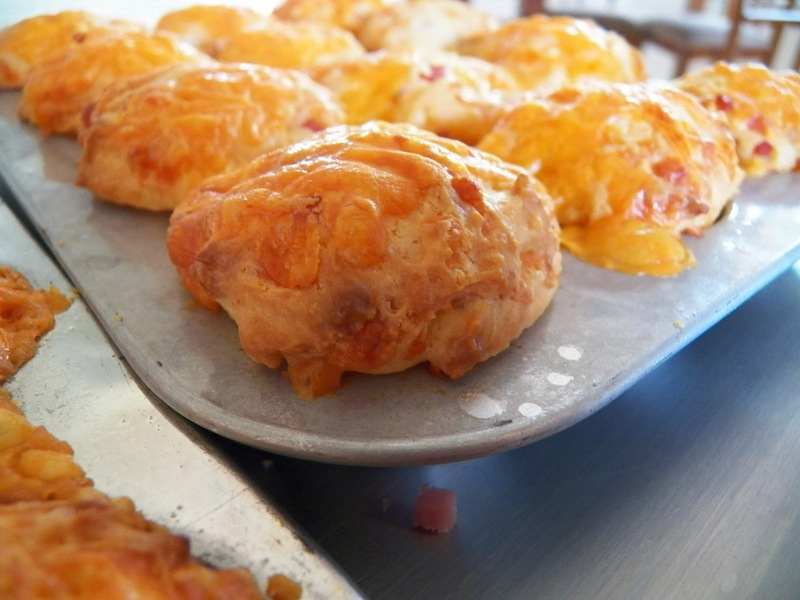 So I made some Sweet Cheddar muffins I made them from this recipe, Sweet Cheddar Cheese Muffins, from this site, Betchacan’teatjustone. I also made them mini’s, mainly because I just wanted to, and I thought it might just work out that way. I also paid attention to what she said about how sweet these were and I cut the sugar in half, which worked out well. And I’m having fun with this recipe, stay tuned tomorrow for a little twist I did on them as well. The recipe says you get 12 muffins from this, and I got 24 + mini muffins. There was just a little leftover batter so I bunged it into a tart pan and baked it. The following is her recipe with my changes in blue to the side. Preheat the oven to 425 degrees and have the oven rack on the highest section of the oven. In a large bowl, beat the sugar with the oils until well combined. Add the eggs one a time, beating well after each addition until smooth. Sift together the flour with the baking powder, soda, salt and nutmeg. Stir the flour mixture into the butter/sugar/eggs until just combined. Be sure to scrape the bottom and edges of the bowl with a spatula to be sure everything has been mixed in! Stir in the buttermilk and sour cream until the batter is just combined, Don’t over mix the muffins! 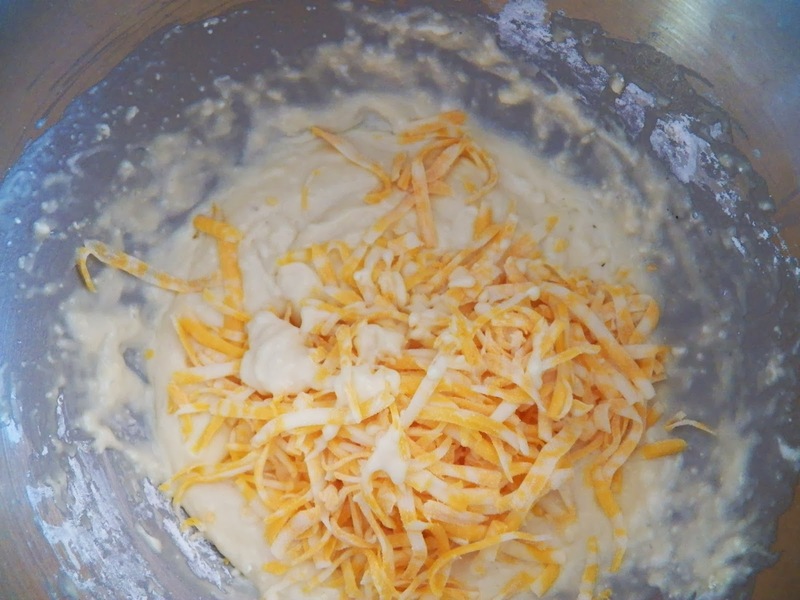 Toss the grated cheese with the remaining 2 tbsp of flour so it doesn’t all clump together when you add it to the batter. 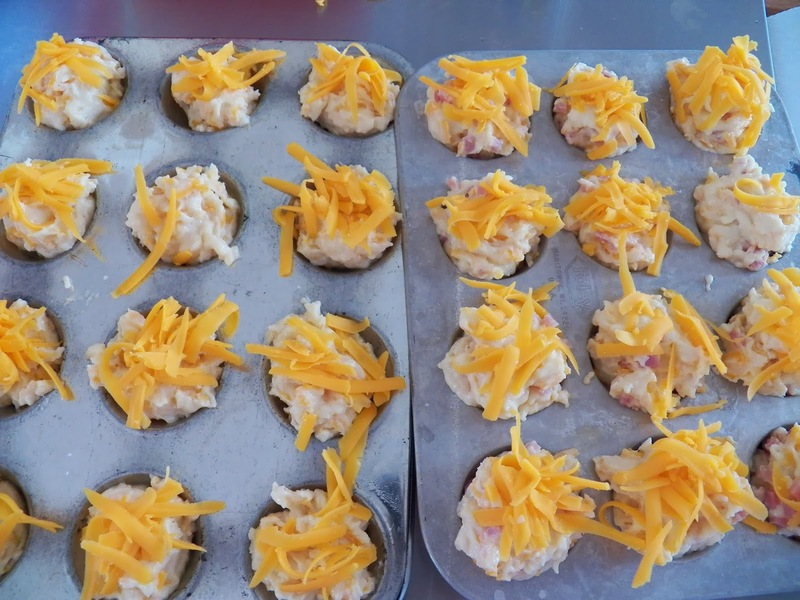 Stir in the cheese and then scoop batter into prepared muffin tins. Place the oven rack in the highest portion of the oven to get a nice high muffin top. Bake for 15 minutes before reducing the oven down to 350 and continue to bake for another 10-12 minutes or until the cheese is bubbly and the edges are turning a light golden brown. Let muffins cool slightly in pans before removing to cool completely. * I have to say, by following all the steps, I overmixed the batter. The next time I made these, I added the cheese to the dry flour mixture and added the buttermilk and yoghurt to the eggs and proceeded to mix according to the way I was taught to make a muffin, by pouring the liquid into the dry and barely mixing them, they rose better and were more muffin like). That being said, they were really good, even if I over-mixed the batter a little. 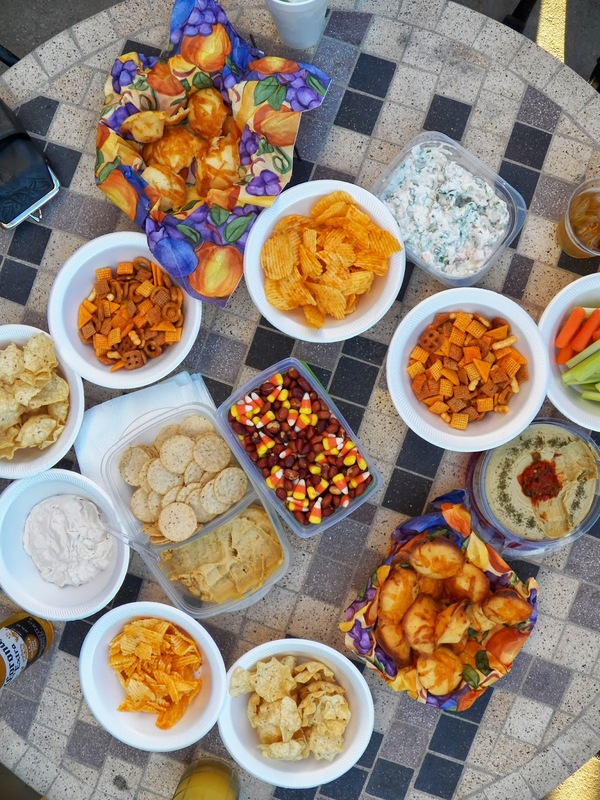 I took them with me to my usual Friday Night gathering and they were well received. We had a kind of Halloweeny, orange theme going there. I love æbleskiver, and in fact make them for myself every so often, they do take a little planning, but then again, it’s for me and I’m worth it. And gee, sometimes I just plain crave a taste from my childhood. Mom used to make these in the summer when we were haying, she’d make them as a kind of fourth meal, and they would be inhaled. Or she’d make them as a special breakfast from time to time, but would make a couple of pans first, then start serving them, cause gee, they would disappear rapidly, and we’d all be waiting in breathless anticipation for the next batch to come out of the pan. To make æbleskiver, you need a special pan. I have two, one which my mom gave me after I got married and the second one is one that my husband’s grandmother gave me. She actually gave me her pan, the one she’d been using for many years. Grandma not only knew what aebleskiver were, she’d made them. When she found out I knew how to make them as well, she gave me her pan. And I treasure it. And yes, I did make her some æbleskiver from time to time as well. In fact, on one memorable occasion, I made a batch, took them to her in the nursing rehab facility where she was staying at one time, and let her feast on them. I think I was in danger of being mugged by her fellow inmates, they were jealous, as were the nurses. That’s OK, Grandma got a nice dinner that night. Sorry, I get sidetracked sometimes. At any rate, I store my pans in brown paper sacks, the kind you get from the grocery store. Keeps them rust-free and clean. I think that’s the way my mom stored hers as well. 1/4 stick clarified butter for frying, or peanut oil. Separate eggs, whip egg whites til dry, and set aside. Mix egg yolks with sugar and beat til the sugar is dissolved and the eggs yolks look almost white. The sugar crystals should be dissolved into the yolks. Mix the egg yolks and sugar with the buttermilk, blend well. Add the melted butter. 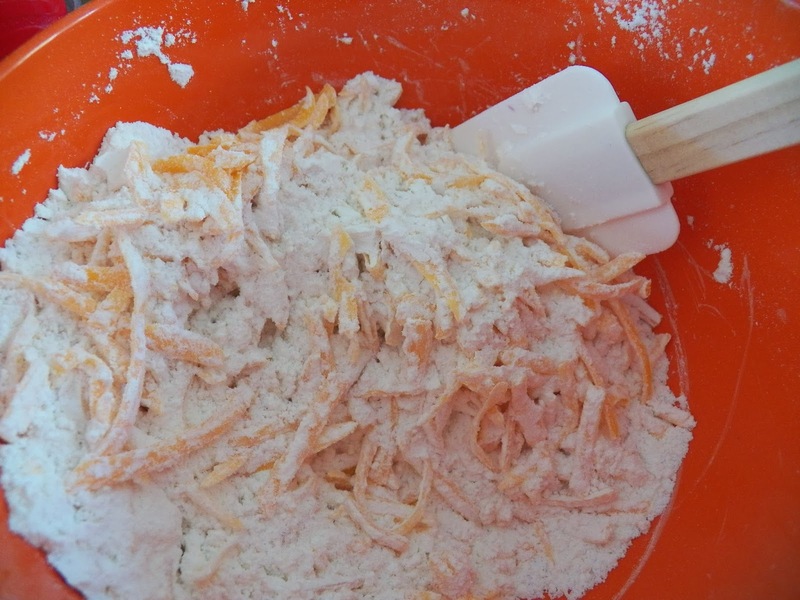 Fold in the dry ingredients, mixing as little as possible, you will still have chunks of dry in there, and that’s OK. Fold in the egg whites, cutting it through just four times. By which I mean, you put the whites in the bowl, cut through the center and fold towards you, turn the bowl 1/4 way, fold once again, turn bowl, fold again, and finish by folding it through one last time. Just be careful to not overmix. You will have chunks of egg whites, but they will be small, and you do want them there. ** I added two tablespoons of sour cream this time round and really liked the taste. I would say this would be optional, nah, from now on, I’m adding sour cream to this recipe. I’ve been seeing a lot of pancake recipes with sour cream in them, and wanted to try it out. I just love being a guinea pig tastetester. Heat pan, and place a little clarified butter in each indentation, let heat. Don’t worry if you have chunks of egg whites in the batter, they will cook just fine. This was my husband’s grandmother’s pan. I think she would love the idea it was being featured here. Have a knitting needle or a wooden skewer handy or even a fork. As soon as you’ve finished pouring the batter in the last indentation, the first aebleskiver will be ready for turning. And I forget to take a picture of me turning them. You lift up the edge, turning the ball a little and letting the batter flow from the middle to the bottom of the indentation. Proceed around the whole pan, turning each one just about a quarter turn. You do need some practice on this, and be ready to sacrifice a pan full getting the hang of it. I usually screw up the first pan full as well, but I eat the mistakes so no one ever knows. Just don’t tell anyone, OK? By the time you’ve finished turning them all once, they should be a nice golden brown, and spherical in shape. Take them out and place them onto a heated platter or just onto the plates and serve. Traditionally these are served with Raspberry Jam and a sprinkle of powdered sugar. I like mine with Strawberry Jam or syrup or just dipped in some sugar, there is no wrong way to eat æbleskiver.